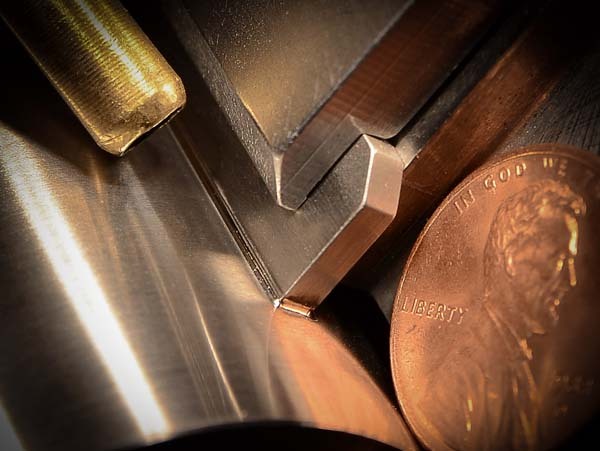 This photograph by Brad Henry illustrates a micro laser weld. The gold–colored tube in the upper right is the welding nozzle and the penny is there to demonstrate the size of the weld to the 316L stainless steel. Photo courtesy of Superior Joining Technologies, Inc.
By giving themselves a 3D printed prototype, an Illinois firm solves manufacturing challenges quickly and wins the part. Sometimes that first step is the most important. When Superior Joining Technologies, Inc., welded a stainless steel thin wall tubing assembly for an aerospace customer, Superior prototyped the part first by 3D printing it. That gave Superior a printed mock–up of the final assembly, which helped Superior win the part. It also eased the step of fit–checking, and helped Superior create the heavy duty, complex tooling required to cut, weld, machine, and precision–join the assembly. "An aerospace engineering company designed a set of convoluted tube assemblies to be used in a very tight tolerance, high visibility weld," said Teresa Beach–Shelow, president of Superior Joining Technologies Inc., in response to a Design–2–Part editorial survey. The part belongs to the emergency air supply in a spacecraft. The part required AWS D17.1 Class A welding, which is the class of welding for critical components, the kind that keep aircraft flying and keep the crew alive. "Superior Joining was 100 percent successful with our first Qual units, which is an enormous advantage for the time line of the project." The 3D modeling helped Superior Joining design the part's manufacturing process. Superior Joining 3D printed the part from polylactic acid, a bioplastic that is biodegradable. The final part was welded from 21–6–9 stainless steel thin walled tubing. "Being able to use the 3D printed part for our tooling and the verification of the part in the end for reference was important, so our 3D part was used up until we shipped the final welded assemblies," Beach–Shelow said in a follow–up interview. "The 3D printing validates several things for Superior Joining, the customer, and our suppliers that needed to [apply] a specific process to the parts. The same fixture allowed the EDM supplier to verify access to the part where they needed to get to. The fixture was also able to be used by our welders. The fixture held the part in place, allowing the welder to perform the weld while keeping the part stable and reducing heat transfer, which can tend to move other parts of the material during the welding process." The manufacturing processes included gas tungsten arc welding (GTAW), machining, and precision joining, along with the 3D printing to get it started. Superior Joining has manufactured approximately 15 of the parts to date. "The additive manufacturing process is being used across all industries, and we see it as the next big innovation to the aerospace market as it is being used more and more," Beach–Shelow said. The 3D printing process helped Superior create its tooling and verify the end part for reference. Superior used the 3D printed part until they shipped the final welded assemblies. "Aerospace companies are using the process currently and implementing it to create parts directly, to move away from the traditional process of machining and manually removing material to create a part." Here a welder at Superior Joining Technologies Inc., demonstrates the manual GTAW (TIG) welding process with metal filler material on an aluminum framed used in a testing apparatus. Photo courtesy of Superior Joining Technologies, Inc.
Superior Joining uses 3D printing on low quantity products that require high quality. "The clear advantage, as it relates to time, is that we can proceed with confidence or make changes earlier with less cost impact and time impact," Beach–Shelow said. The 3D printing process helps get the part right the first time. It appears to add an extra cost, Beach–Shelow but that is small compared to the time and costs of building and scrapping test parts without using the 3D printing process. "The printing process itself is fast (1–20 hours of printing, plus the printer can be run without being monitored/manned), as it depends on the size of the piece and how accurately it needs to be printed." Why use 21–6–9 stainless steel tubing? It was provided by the customer and required by the contract. "The parts will be used in an environment that would cause corrosion over time, and this material will withstand the environmental impacts that could be caused if using other materials, such as carbon steel," Beach–Shelow said. Superior Joining Technologies, Inc. (www.superiorjt.com) was founded in a Rochelle, Illinois, garage in 1992 by Thom Shelow, and today it is an AS9100 certified firm specializing in micro–TIG and micro– laser welding. The firm has 25 years of micro–welding experience. It employs 28 people and operates out of a 55,000–square–foot factory in Machesney Park, Illinois. The company describes micro–TIG as microscopic tungsten–inert gas welding. "Micro welding is a process of performing minute fusion welding operations on intricate assemblies with minimal heat input to the part," Superior said on its website. It requires precise specialty equipment. "A high–powered microscope to look through, along with a low– powered TIG welder to perform the work" is required, Beach–Shelow said. "Our micro laser machines are similar, as they are a lower power laser with a microscope set up for the welder to look through that is already configured to work with the laser beam at a specific focal point. 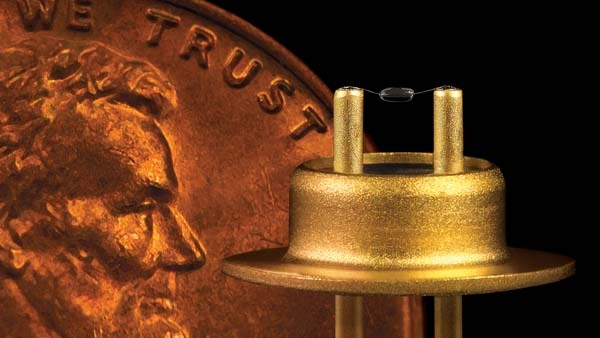 This micro welded part is a thermistor with gold–plated terminals that are now connected by a platinum wire that is only 0.0008 inch thick. The penny demonstrates how fragile the wire is that is shorter in length than the cross on the letter "T" in "Trust." An imperfect weld would simply melt the wire. Photo courtesy of Superior Joining Technologies, Inc.
"Precision work and parts that are small and thin require minimal heat input," Beach–Shelow said. "The aerospace market wants everything smaller and lighter, which means the welding needs to be smaller and less weight. Some customers require or specify the process to be used per their prints or drawings we are given. Otherwise, the part itself will direct us to micro welding if needed due to the size or thickness of the part. Thin walled tubing is generally a great candidate for micro welding." "Micro welding is beneficial for small parts and precise welding requirements," Beach–Shelow added. "The micro welding from both TIG and laser creates a joining of the materials quickly without inputting additional heat into the part. The heat affected zone of a weld is a crucial part and needs to be minimized so that it does not warp or move the part while being welded." "Gas tungsten arc welding (GTAW), or tungsten inert gas (TIG) welding, is generally a cleaner process, with no secondary process needed to the weld," said Beach–Shelow, meaning no grinding or reworking is needed. "Less heat will prevent the part from warping. 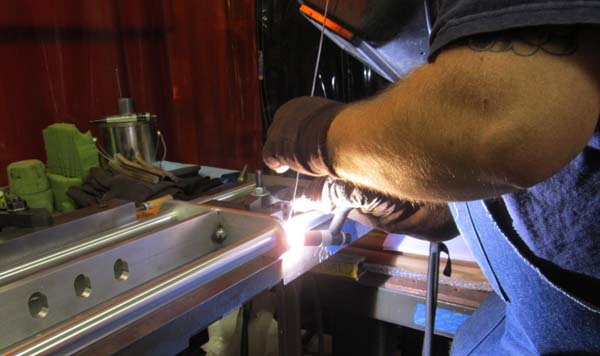 Metal inert gas (MIG) welding is a faster process, but inputs more heat and creates sparks or potential spatter." 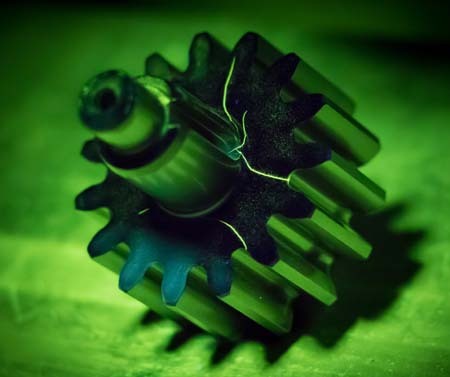 This gear photograph under a fluorescent die demonstrates the usefulness of penetrant inspection. The lines revealed by the die reveal cracks in the metal. Photo courtesy of Superior Joining Technologies, Inc.
Superior Joining Technologies operates a multi–axis laser cutting and welding process, as well as non–destructive testing that includes fluorescent dye penetrant and magnetic particle inspection. Because of the company's FAA certifications, the processes certified include welding, fluorescent penetrant inspection (FPI) and magnetic particle inspection (MPI). Superior Joining is UTC Aerospace–approved to American Welding Society (AWS) standards for aerospace welding applications. The company is an FAA certified, drug and alcohol free workplace. Its customers include Boeing, BE Aerospace, GE Aviation, BVR Aero, Unison Industries/GE, Inertial Airline Services, and Monogram Systems. Among other aircraft, Superior Joining has provided welds for the Gulfstream G5 and G4. It has provided parts for Boeing's 717, 787, MD–90, and MD–95. "Our multi–axis laser can cut holes down to 0.015 inch in diameter. The micro laser machines allow Superior to weld metals as thin as 0.0005 inch thick and produce welds thinner than a human hair," Beach–Shelow said. A part installed in the multi–axis machine that combines laser welding and laser cutting can stay in the original fixture for both processes, if needed. Superior Joining manufactures potable and non–potable water tanks for 17 different airplanes, and is a certified FAA repair station. "There is a formal audit of our facility and specific testing requirements that our personnel must complete. This includes the special process of welding or testing of parts, along with a stringent FAA Drug and Alcohol Program that our employees follow," Beach–Shelow said. Superior Joining Technologies is also an approved supplier of laser welding, fusion welding, and non–destructive testing (NDT) for United Technologies Corp (UTC). It is ISO 9001–2008 certified, and the company's non–destructive testing, FPI, and MPI services are Nadcap certified. Superior's Fusion welding and laser welding are also Nadcap compliant. The fluorescent dye penetrant inspection will reveal casting and forging problems, including cracks, micro shrinkage, porosity, and leaks. In addition to checking new parts, it will reveal fatigue cracks on in–service components. The part determines which testing method to use, Beach–Shelow said. "If the material is non–ferrous, that means that it will need to be tested with fluorescent penetrant, as it contains no lead and is not magnetic. Magnetic particle can only be used on materials that are ferrous/magnetic. "Because NDT does not permanently alter the article being inspected, it is a highly valuable technique that can save both money and time in product evaluation, troubleshooting, and research," Beach–Shelow added. "This process is required by industries that need to verify the materials/parts are not damaged before being used. "Details to be watched or noticed are where the heat is applied," Beach–Shelow continued. "Accurate fit–up of the part is mandatory to control where the weld is being applied so that the right amount of heat is applied to the correct area. For UTC, Superior Joining Technologies is we are an approved supplier for laser welding, fusion welding, and non–destructive testing. "This allows both UTC and any of their suppliers and customers to work with Superior Joining Technologies for any of these processes," Beach–Shelow said. Is there a difference between ISO certification and FAA certification? "They are both equally stringent organizations. Being approved for both accreditations is an honor and a showcase of the craftsmanship and capabilities of our entire team," Beach–Shelow said. "As a Nadcap, ISO 9001, AS9100, and FAA Repair Shop accredited welding laboratory, our capabilities are of interest to engineers as our processes and performances have already been audited, reassuring the engineers their parts will be built correctly and on time the first time."